It is of common knowledge that Google is virtually the backbone of IT sector at the moment. With the sets of services Google has launched besides it being the search giant, are what truly contributes to its reputation. Google brought a big leap in cloud computing when it first introduced its Google Drive. The service was initiated with the goal to make Microsoft Office’s service online turned out be the biggest cloud syncing and storage service the world had ever seen. Apart from storage, it provides up to the notch services for editing and collaborating your documents online on the cloud platform. Google services with app integration in the cloud to individual users and best uptime has brought Google Drive among the top of the products of its class. 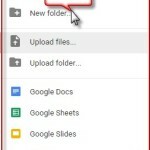 With companion options like Google Docs, Google Slides, and Google Sheets almost all the functionality is provided with the storage on the drive and all for gratis. Google has been more generous than his rivals in providing his services for free to its users with synchronizing options and direct accessibility from phones for at a glance monitoring of your files and data. 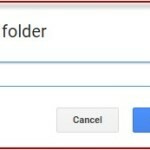 Google also provides an applet to create a direct accessibility option from your PC by creating a folder on your PC linked to the Drive storage for straightforward and efficient management. 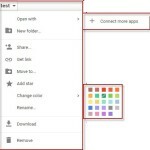 Google syncs user’s mail account to the drive and provides 15 GB storage space for free. File sharing has never been easier with Google Drive on the forefront as it provides a collaboration with third-party apps that enable a registered user to send signed documents and even faxes. Google has always been very straightforward with its plans and upgrades. 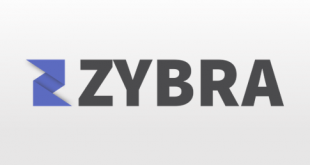 Though it already provides 15 GB for free cloud storage which is ample for individual users, it also provides extended storage apt for small and medium business storage requirements and that too at a very meager cost. 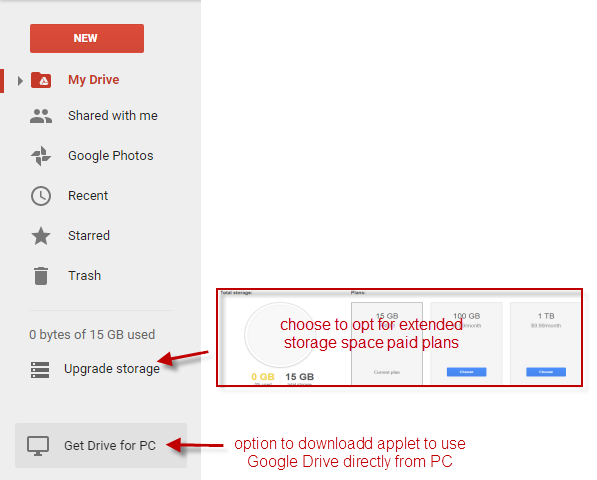 Google does not believe in the annual plan and charges a monthly fee for providing extended storage. For extended storage up to 100 GB Google charges $1.99, for 1 TB it costs $9.99 and likewise for 10 TB, 20 TB, 30 TB the prices rise successively $99.99, $199.99, $299.99. At any point, a user can discontinue his plan and after termination of the plan will be left with 15GB space. In addition to the above pricing, users might be charged with taxes, but Google asks no additional fee of any kind. 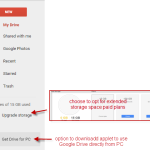 Starting up with your initial drive operations is very easy, Google just asks you to sign up with his Gmail services and provides you with accompanied drive storage.Sign up can be done by filling a form located at the destination and with a simple sign up process, you will have your cloud storage ready to go. 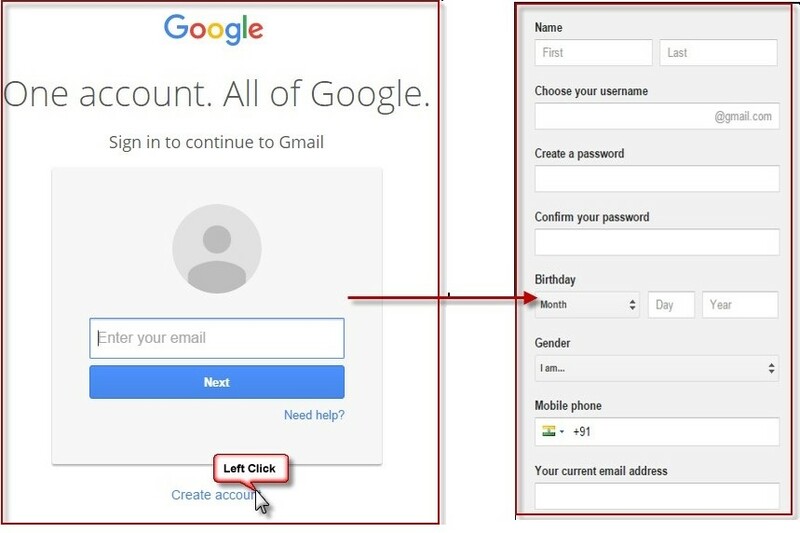 After a user fills the form and signs up, Google greets him with Gmail dashboard, the central location to access all the emails and integrated Google apps including Google Drive. A new window with user’s drive dashboard opens. 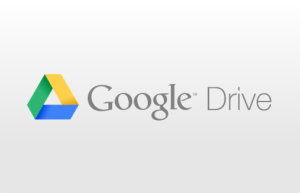 The Google drive dashboard contains all the access options a user will require to manage his cloud storage and syncing operations along with access to document editing facilities. It also provides the user an option to get a Google Drive solution for PC to maintain quick links with the cloud and immediate file sharing options. The dashboard consists of a side menu and central pane. The central pane is where a user will view his files stored on the cloud service. 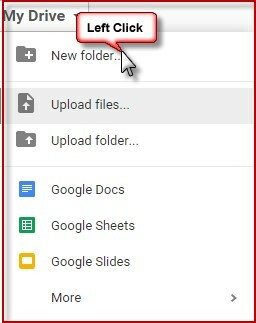 The central panel has a ‘My Drive’ drop down list with options to add items to Google Drive and organize them under different folders for efficient management.It also provides access to document editing tools that a user might require for online editing of documents. 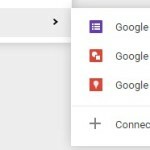 The side panel consists of a list of secondary option to view your Google photos, recent activity and those documents a user has marked important. Deleted documents can be found under ‘Trash’ option for restoration purpose. 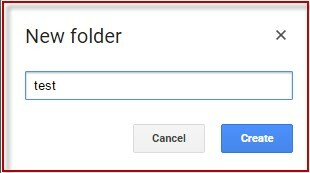 Uploading files to Google Drive is very easy. All a user need to do is create a directory folder and upload files in that directory. 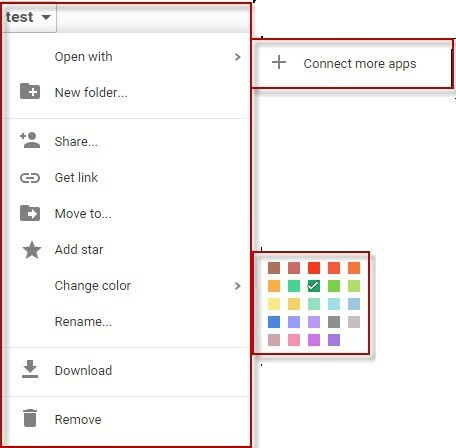 Double click on the created folder and the dashboards pops up with additional options to manage and customize files within the folder. To upload a file, users need to simply choose a file from the upload dialog box which pops up when ‘Upload Files’ option for ‘My Drive’ drop down list is selected. To move a file in a folder simply drag the file and drop it in the folder. Shared with You option displays the files any other user has shared with you. 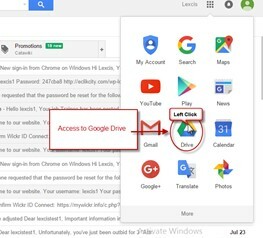 Any file that has been sent to the user as an attachment with the mail can be directly stored in the Google Drive by dragging to it. Google Photos option lets the user create a repository for all the photos. It enables easier access and management as the photos are separately categorized than the files. The Recent option brings forward all the recent activities that have occurred around the Google services including emails and Google Drive. The Starred category contains all the files that have been marked as starred by the user. For the files that a user wishes to consider as important can be marked as starred. It ensures that the important user files are very easy to locate. Generous gratis services with free 15 GB storage space. Online document editors to edit documents on the go. Facility to upload directly from PC folder with the applet. 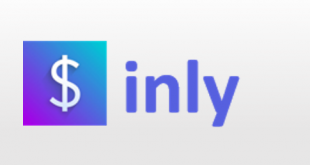 Integration with other Google products and services. 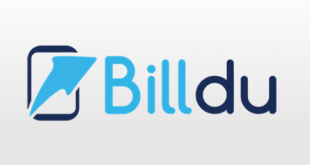 Dedicated mobile app for iOS and Android. Activity Stream views to keep track of documents and files being edited and updated. Having a file downloaded to a device stops it from being updated, even if changes are made after the download. 15 GB storage for both email and Google Drive combined and not just for Drive. If a user wants to create documents using Google Drive’s tools, he will have to export those files into another program to edit them. With the file syncing service, if a user deletes a file from the local machine, it also gets deleted from Google drive automatically. Google Drive provides a free 15 GB of storage along with online editor so that you can edit any document either while on go. This 15 GB of storage is for both email and Drive. It allows you to integrate with other google products and can upload any of you files directly from PC folder with the applet.Google drive has many rich functionality which makes it the best cloud storage tool. For more details, please visit: Google Drive website. You can find the detailed Collaboration tools product reviews for OneDrive and Box for a quick comparison.